Here in Wisconsin we are known for: Beer, Brats, Cheese and Our Love of Sports. But what people might not know is, here in Wisconsin we have a Sweet Tooth. We love our Chocolate. Good, Quality Chocolate. Ambrosia Chocolate. 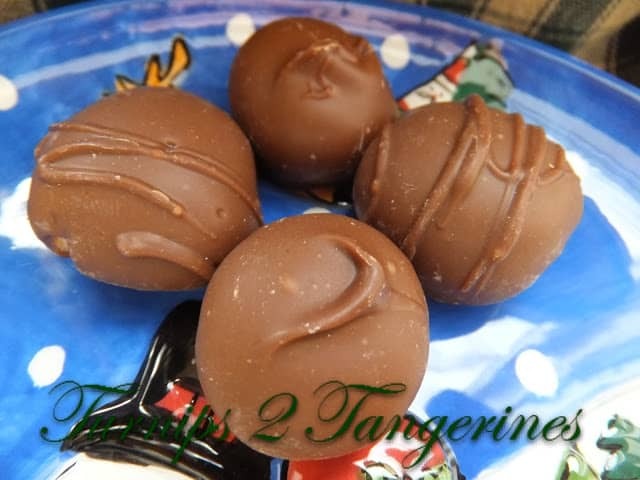 It you are from Wisconsin and you carry on your family’s tradition of making homemade chocolate Christmas candy, you know all about Ambrosia Chocolate. Your grandma, mom, great aunts, in-laws, everyone you know, makes Christmas candy using Ambrosia chocolate. It is “The Only” chocolate you would use to make your Christmas candy with.During the months of November and December, you can find Ambrosia Chocolate at any grocery store in Wisconsin. You can buy it by the pound or in 10-20 lb slabs. Ambrosia Chocolate has been in Milwaukee since 1894 and it has been a family tradition in Wisconsin ever since. As soon as my Christmas tree is up and decorated, it’s time to go to the grocery store and buy some Ambrosia Chocolate. It just would not be Christmas in my house without Ambrosia Chocolate. The holidays are here when that familiar slab of Ambrosia chocolate can be seen sitting on the counter top waiting to be melted and made into my families favorite candies. Oh how I love the smell of melting chocolate. Peanut Cluster Anyone?? Double Chocolates? Melt dipping chocolate in a double-boiler until smooth and creamy. Let chocolate cool until lukewarm. Whip whipping cream with 2 tablespoons sugar and a pinch of salt, until stiff peaks form. Fold whipped cream into cooled chocolate. Place mixture in the refrigerator until you can roll mixture into 1 inch balls. Roll chocolate/cream mixture into balls. Place balls on 2 large baking sheets lined with foil. Place balls in refrigerator overnight. Melt 1 lb. dipping chocolate, cool. Place crushed peanuts in a shallow baking dish. Dip balls into melted chocolate and then roll in crushed peanuts. Place balls on wax paper lined baking sheets. Put back in the refrigerator until chocolate is set. Place balls between sheets of wax paper in a covered container. Store in refrigerator. Note: The views here at my own. I was not asked nor am I being compensated from the Ambrosia Chocolate Co.
How did you get those to look so perfect? My dipped chocolates look like I did them. 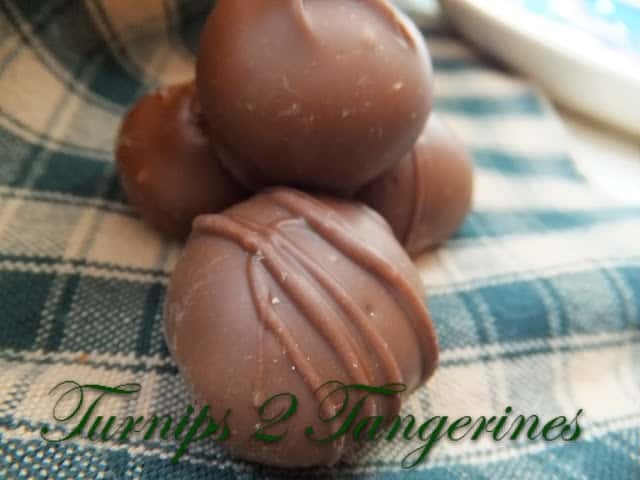 We call those truffles and I have been busy making them this week too! Here in Michigan…I friggen love chocolate!! 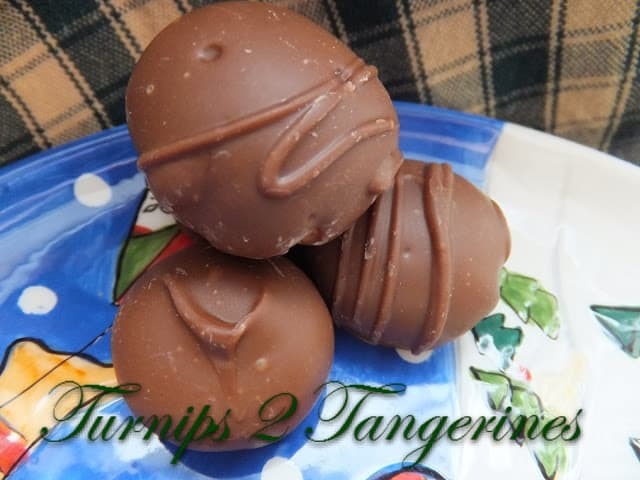 I have been to Michigan many, many times:) I have eaten lots of chocolate in Michigan….especially Mackinac Island Fudge, Dried Cherry Fudge and Salt Water Taffy! These chocolates look delicious! Pinned it! Thanks for sharing at Ducks in a Row!